Now you don't have to run away to join in the circus. 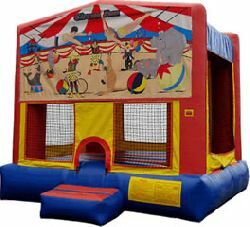 The Circus panel bounce house has a big top, elephants, seals, clowns and trapeze artists displayed on the high quality front panel. Be part of the spectacle while you jump inside (cheers of the crowd not included).